As we near 2019, a range of disruptive forces present distinct challenges for investors – playing out in the geopolitical arena in the form of trade wars, on the policy front in the form of divergent monetary policies, and on the economic front as countries contend with a late-cycle environment. 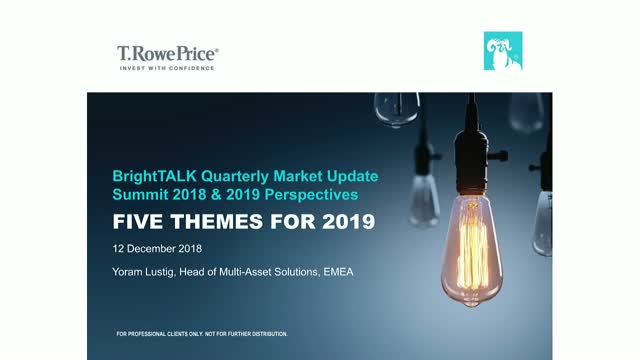 Yoram Lustig, T. Rowe Price’s Head of Multi-Asset EMEA, takes a closer look at the five main themes set to shape markets in 2019 and addresses how investors can prepare. This year, Nick Samouilhan has decided to subject his investment processes to the same scrutiny as our eating and exercise habits. He outlines three New Year's resolutions that don't involve running or bacon rolls. For Professional Clients only. Not for further distribution. Portfolio Specialist Laurence Taylor assesses the prospects for global equities in 2019. He discusses why he is optimistic over the health of the global economy despite market pessimism over the global cyclical outlook. Japan equities had a tough end to 2018, with the asset class being hit by the full force of investor selling pressure. Yet, Portfolio Specialist Laurence Taylor remains optimistic. With valuations flagging a recessionary environment and profits likely to grow, he reveals how Japan Equities is likely to provide investors with compelling investment opportunities this year. Andrew Keirle's fund has an 11-year track record in the multi-faceted, sometimes misunderstood but often rewarding, world of EM local currency debt. He'll discuss how active management can help reap the very real benefits of a high-yielding, largely investment-grade asset class, while managing the risks. Oliver Bell, Frontier Markets Portfolio Manager, recently provided an update on the current market situation and his outlook for the asset class in light of recent developments. The recording is now available to view here. How have the asset class and fund performed in 2018? What impact will upcoming index changes have? What is our outlook for the region and latest views on Argentina? In this video Eric Moffett, discusses the key elements for success when investing in Asian equities. In this video Eric Moffett, discusses the major opportunities and risks for investors in Asian equities. • What are the opportunities in China A-shares? • How vulnerable is Asia to an escalation in trade disputes? • How much of a concern is a China slowdown? Our current view on equity markets is that we are still in an environment defined by stability and improvement but you are seeing, in terms of February and March’s volatility perhaps a sense that some of those drivers of last year’s very strong return – 25% from global equities – starting to be more mixed in terms of data. In this video Laurence Taylor, Portfolio Specialist for the Global Focused Growth Equity strategy speaks about equity markets and how we are positioned today. Oliver Bell, Frontier Markets Portfolio Manager, was recently joined by four Frontier Market analysts to discuss their latest ideas from recent research trips. If you missed the live webcast, the recording is now available to view here. ■ What do Sri Lankan politics mean for our investment thesis? ■ How are we playing the strong consumer in Vietnam? ■ Where are we finding opportunities in late-cycle Romania? The team also talked about Argentina, which has experienced heightened volatility since the webcast was filmed. Argentina typifies the investment case for frontier markets but the transition from poor economic policy to good long term reform policy is always difficult as politicians have to keep one eye on the ballot box whilst instituting near term socially harsh or costly reforms. In the team’s discussion we alluded to some of the monetary policy challenges the country faces as it tries to bring down inflation and inflation expectations. Argentina has benefited from a weaker US Dollar, cheap global money and the chase for yield. But this environment is being challenged and earlier missteps by the Argentinian central bank (cutting interest rates and lifting inflation targets) has led to a credibility gap being punished by the markets. The rapid ratcheting up of interest rates to 40%, among other measures, should stabilise the peso and enable the economy to continue on its disinflation trend, which we believe should be positive for the country’s longer term outlook.